A trailing bog plant with perennial, somewhat woody, slender, creeping stems, rooting at the nodes, the branches 5 to 10 inches long, and ascending, forming dense mats or thickly interwoven with moss and other vegetation of the bog. 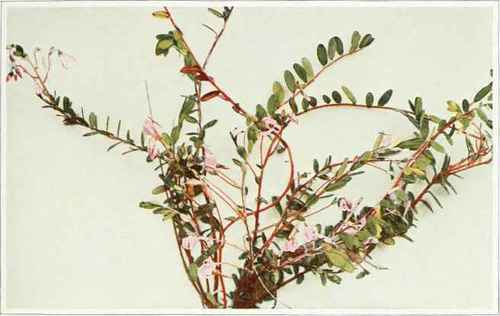 Leaves alternate, very short petioled, thick, evergreen, oval, oblong or slightly obovate, blunt at both ends, entire, one-fourth to two-thirds of an inch long, one-third of an inch wide or less, pale or glaucous beneath and slightly revolute on the margins. Flowers pink, one-third to one-half of an inch broad, nodding on erect stalks, usually somewhat racemosely clustered. Stamens eight or ten, the filaments distinct, the anthers united into a long-pointed cone, prolonged upward when the flower is opened, and conspicuous as the petals are recurved; anthers opening by a pore at the apex. Fruit a globose or oblong, juicy, red berry, many-seeded and acidulous, one-third to three-fourths of an inch long. In bogs or boggy meadows, Newfoundland to Ontario, south to Virginia and Arkansas. Flowering in June and July. Fruit ripe in September and October. Extensively cultivated in New England and New Jersey for its fruit. The Small Cranberry (Oxycoccus oxycoccus (Linnaeus) MacMillan) has smaller, thicker, ovate leaves and pink flowers about one-third of an inch broad; the fruit is about one-third of an inch in diameter or less and often spotted when young. It is found in cold bogs, especially northward. The Creeping Snowberry (Chiogenes hispidula (Linnaeus) Torrey & Gray) resembles somewhat the Small Cranberry and grows in similar situations. It is somewhat hairy, and the small oval or ovate leaves one-sixth to one-third of an inch long are smooth above but sprinkled beneath with numerous, appressed, stiff, brownish hairs; flowers few, nodding, about one-sixth of an inch long, white; fruit a small, snow-white berry.